SAN DIEGO, Calif. -- An Orange County, Calif. couple with reported links to a notorious 1965 Indiana murder case has gone missing after visiting a San Diego casino. Cecil Knutson, 79, and Dianna Bedwell, 67, were driving from the Valley View casino in San Diego Sunday to their son's home in La Quinta, about 130 miles northeast, for a Mother's Day celebration, reports CBS Los Angeles. They never showed and no one has seen them since. There was also no sign of them at their home in Fullerton, about 100 miles north of the casino. According to the Indianapolis Star, Dianna Bedwell is the older sister of Sylvia Likens, who was slain 50 years ago in a murder that's been called "the most terrible crime ever committed in the state of Indiana." Likens was 16 when she was killed in October 1965 at the hands her caretaker, Gertrude Baniszewski, some of Baniszewski's children and other neighborhood children, reports the paper. Likens body was reportedly discovered malnourished, covered with sores, burns and bruises, with the words, "I am a prostitute" etched into her abdomen. Baniszewski was found guilty of first-degree murder the next year, and her daughter Paula was found guilty of second-degree murder. Three others - a son, John Baniszewski, and neighbors Coy Hubbard and Richard Hobbs - were convicted of manslaughter, reports the paper. Knutson's daughter Kristen Smith, who is Bedwell's stepdaughter, told the paper that Bedwell's father had placed Sylvia and another daughter in Baniszewski's care as he traveled to make money for the family. Bedwell was 18 and married at the time, living with her first husband, while two other brothers were living with grandparents, reports the paper. Smith said that Sylvia's brutal murder continues to haunt Bedwell. "It's a really heart-wrenching subject," Smith said. She said Bedwell married Knuston 25 years ago, and the two were bus drivers before they retired to Orange County, Calif. The couple's son, Robert Acosta, told CBS San Diego that both his parents suffer from diabetes. "If there is a traffic accident, and they're at the bottom of some canyon and no one can find them, they don't have insulin," he said. According to the station, crews are searching roads for signs of wreckage and looking for any credit card activity. The couple's cell phones pinged a few miles north of the casino, but then were apparently shut off. The car is also outfitted with a tracking device similar to OnStar, which was also shut off, either by being removed or damaged, reports the station. "I will not stop until I find my mom and my dad, I just won't," Acosta told the station. "They would never just not show up, they would never just not call." 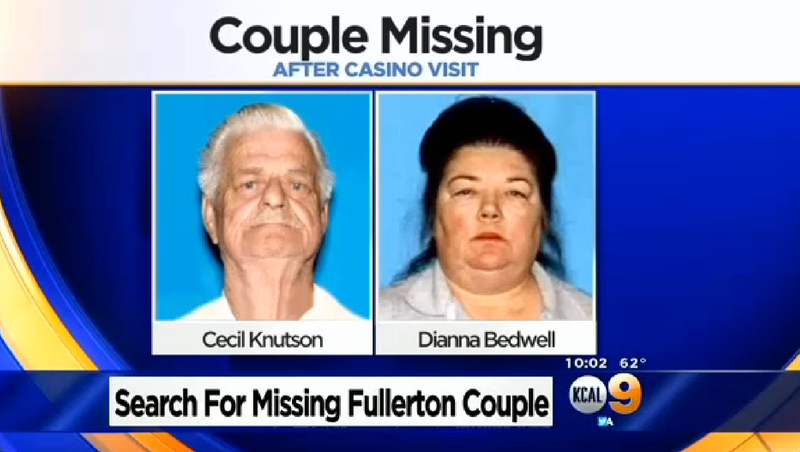 Cecil Knutson and Dianna Bedwell were last seen traveling in a 2014 Hyundai Sonata, California license plate 7EHE981. Anyone with information on their whereabouts is asked to call the San Diego Sheriff's Department at (858) 565-5200.